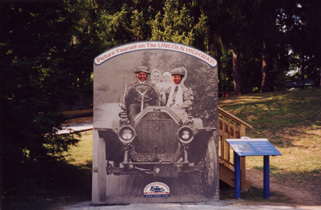 The concept for the Lincoln Highway was initiated in 1913 with the goal of creating the first coast-to-coast paved road network for automobiles. It took over twenty years to pave the entire length, and the project became the centerpiece of the Good Roads campaign that led to construction of a nationally integrated system of highways in the 1920s. The Lincoln Highway Heritage Corridor identifies, preserves, interprets, and promotes the communities, landscapes, and historic resources along a 200-mile length of the original highway in Pennsylvania. The development of an interpretive plan for the corridor was a means of unifying this largely rural landscape through a broad-based regional initiative with a single comprehensive vision. 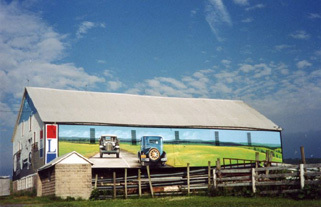 Themes were created based upon the concept, construction, and experience of traveling the roadway. Authentic remaining resources were identified along with the stories of communities along the route. A series of wide-ranging outdoor interpretive projects were identified and then implemented using over $300,000 of transportation enhancement funding. The corridor has become a 200-mile long roadside museum.